Where 2016's Marked for Death battled with Emma Ruth Rundle’s mortality and medical history, and allowed the artist to work through feelings of hopelessness and pain, On Dark Horses tries to take control of the shadows found in life. Instead of succumbing to the darkness, Rundle is now finding a path out of despair and using her music to piece together how that might happen. Her fourth solo record under her own name is still a lush, layered guitar fever dream but the lyrics show a stronger soul, a person who has found that there is light in even the hardest moments that life throws at you. 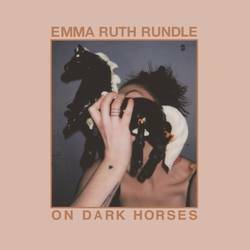 “Darkhorse” is an echoing siren call; the words conjure images of cinematic scope and Rundle’s voice is a powerful instrument in itself. The fragility shows through imperfect cracks and emotion is wrought from every note. The haunting presence of the past stalks the two subjects of the song through gorgeous guitars and drums that gallop in with the beauty of shoegaze before “Races” steps back into itself and gives the blackness of the night the lead. On Dark Horses plays like a Western; at times speaking of great journeys, and in other moments taking on characters and their moral quandaries, and the starkness of the music calls to mind vast deserts and wastelands. “Light Song” introduces another voice to Emma Ruth Rundle’s sound with Jaye Jayle’s Evan Patterson giving a deep and menacing turn as the counterpoint to Emma’s narrator. His vocal lends the trippy vibrations of the song a sinister aura that must be overcome – a constant theme of On Dark Horses – and Rundle’s voice is overpowering at the end despite the delicate textures that are ever present. What may be seen as a weakness can actually be a strength, and on this record, Rundle often turns moments of hopelessness into moments of triumph. The final song “You Don’t Have to Cry” is a perfect example of not allowing the darkness to consume you, and where many of Emma's songs deal with her own pain or personal struggle, this final ode is for another and it’s subtle rhythms and transparent emotion show just how exquisite an artist Emma Ruth Rundle is. Everything is laid bare here, and whereas your own interpretation may differ from what is intended (I took it to be about the death of a close friend), it is still possible to find the light in the darkness. Posted Nov. 12, 2018, 8 p.m.